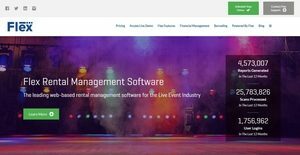 Flex is a web-based rental management software designed for live event industries of all sizes. Described as easy to use, customizable, and powerful; Flex is used by live event industries such as Pro AV, touring; corporate events, production, and equipment rental; party rental, concert, churches, and more. Flex offers a contact management feature which allows industry professionals to manage their relationship with their customers and vendors. This feature also supports managing contacts for freelance labor and venues. Moreover, Flex helps users track and manage their inventory. Its inventory management tool supports virtual items, racks, and road cases. The rental management software can also be integrated with the most common barcode scanners, enabling users to quickly obtain information about their items and products and print labels as well. With the aid of its financial management feature, users will be able to create invoices and track payments. Last but not the least, Flex allows users to create unlimited maintenance procedures for their inventory items: repairs, updates, and cleanings. One of the powerful features of Flex is its maintenance tracking functionality. As part of its workflow management features, this functionality enables users to track all the repairs, updates, and cleanings made for their inventory items within a specific range of time. Flex allows users to record all their maintenance works, so they will be able to track them easily in the future. To streamline the maintenance of their inventory items, Flex provides users with the capability to create their own maintenance workflows and procedures within the software. Thus, they can create customized procedures that best fit the specific needs of their business or company. They will also be able to create maintenance reports, showing logs and records of their maintenance works. Furthermore, Flex offers an equipment dashboard. Through this dashboard, users will be able to track where all their gear and items are currently being used. The software can also automatically calculate the availability of their items, as it supports integration with backorders and sub-rentals. To easily track items, Flex also provides a robust inventory tracking and management feature. With this feature, users will be able to obtain information on their inventory items: quantity on hand, current location, and container location. Because Flex supports integration with the most common barcode scanners, users can easily track their items using barcodes and serial numbers. Flex eliminates the use of third-party label printing software, as users will be able to print labels instantly with the aid of its integration with barcode printers. The other powerful features of Flex are its contact management and event crew staffing/scheduling. Users can set default discounts and payment terms for their customers. In addition, they will be able to schedule follow-up calls instantly. As to managing event crews, Flex enables event managers to easily create schedules for their crew members. They can also communicate with their event crews through the built-in email functionality of the software. If you are considering Flex it could also be sensible to analyze other subcategories of Best Business Process Management Software listed in our base of SaaS software reviews. Since each enterprise has unique business requirements, it is advisable for them to desist from looking for a one-size-fits-all perfect software system. Needless to say, it would be pointless to try to find such an app even among popular software platforms. The smart thing to do would be to catalog the various vital elements that need consideration such as main features, finances, skill levels of employees, company size etc. Then, you should do your groundwork thoroughly. Read some Flex reviews and check out each of the other systems in your shortlist in detail. Such comprehensive groundwork can make certain you reject ill-fitting systems and select the system that presents all the aspects you require for business success. How Much Does Flex Cost? We realize that when you make a decision to buy Business Process Management Software it’s important not only to see how experts evaluate it in their reviews, but also to find out if the real people and companies that buy it are actually satisfied with the product. That’s why we’ve created our behavior-based Customer Satisfaction Algorithm™ that gathers customer reviews, comments and Flex reviews across a wide range of social media sites. The data is then presented in an easy to digest form showing how many people had positive and negative experience with Flex. With that information at hand you should be equipped to make an informed buying decision that you won’t regret. What are Flex pricing details? What integrations are available for Flex? If you need more information about Flex or you simply have a question let us know what you need and we’ll forward your request directly to the vendor.